In 1977, Texas bass pro Rick Clunn won a major tournament on Tennessee’s Percy Priest Reservoir. The fact he won an important bass-fishing event wasn’t surprising for this outstanding angler, but at the time, the lure and method he used were considered somewhat odd. Clunn cast his way into the winner’s circle using an obscure bait called the Lunker Lure, which thereafter became one of the most popular bass-fishing lures in America. According to many experts, this was the beginning of the buzzbait boom. The buzzbait craze caught fire in the late 1970s, but buzzbaits had been around a while, even then. Perhaps the earliest buzzbait of all was the Al Foss “Oriental Wiggler” patented in 1918. It didn’t resemble buzzbaits we use now, but it did feature a single, large, cupped blade ahead of the lure body and hook. Buzzbaits are now mass-produced by dozens of lure companies. And today’s anglers know, for galvanizing topwater action for lunker spring bass, buzzbaits are hard to beat. Most buzzbaits resemble spinnerbaits but have a large winged blade that revolves around a shaft instead of on a swivel. The big blade (or blades) churns the water as the lure sputters across the surface, creating a bass-attracting commotion. There are two basic buzzbait designs. The most popular models resemble a safety-pin spinnerbait, with the upper arm supporting the propeller-type blade, and the lower arm being the body of the bait and concealing the hook in a skirt or trailer. The prop is typically heart-shaped, with the tips of the two lobes bent in opposite directions. When the lure is retrieved, these turned lobes give the lure lift. The more the blades are cupped or bent, the more lift you get. The more lift you have, the slower you can retrieve the lure and still keep it on the surface. The second type of buzzer is the in-line or single-shaft model. These are shaped like an old-style in-line spinner, with the buzzing blade riding directly in front of the body. Some such buzzers have a plug-like body that floats, the advantage being you can fish them in one small spot over cover that would entangle a sinking lure. Also, they can be worked slowly and teasingly when bass just won’t chase a fast-moving buzzer. Variations to these basic designs are numerous. Foremost among these is the addition of a second or third propeller blade. If one blade is good, two or three are better, or so some bait makers would have us believe. The additional blades are attached on an extra arm or arms and rotate with a counterspin that increases lift, allowing you to retrieve the bait extra slowly while still keeping it on top. Buzzbaits come in a wide variety of colors and sizes to suit your bassin’ needs. Many have additional bits of hardware that add clacks, purrs, squeals and other bass-attracting sounds to the bait’s normal spitting and sputtering. Many anglers will tell you the more noise a buzzbait produces, the more readily it will attract bass to investigate. Buzzbaits are topwater lures, but they offer distinct advantages over conventional surface lures like poppers, prop baits and stickbaits. First, buzzbaits can worked with a fast retrieve and still be effective. In nearly all other forms of topwater fishing, a slow retrieve catches more bass than a fast one. But buzzbaits work on a different principle. These lures don’t resemble natural bass foods. They appeal more to the striking instinct of bass than the feeding instinct. Even with the slowest retrieve, buzzbaits move with a steady, sputtering action, chopping the water, kicking up spray and making tin-like noises. Perhaps they agitate bass into hitting or entice them out of curiosity. No one knows for sure. But whatever the reasons bass strike, anglers could care less. Everyone likes the results. Second, buzzbaits can be fished over brushpiles, logs, weedbeds and other thick cover with few irritating snags. It’s harder to do this with a topwater bait that has two or more treble hooks on it. Though buzzbaits will hang, especially in some types of grass and reeds, it doesn’t take an angler very long to learn how and where to fish these lures, even in extremely heavy cover. Third, fishing buzzbaits doesn’t require the fine touch that jig or plastic-worm fishing demands. In spring, novice anglers often find success with buzzers simply by casting and retrieving on shallow flats and shorelines where bass are spawning and feeding. 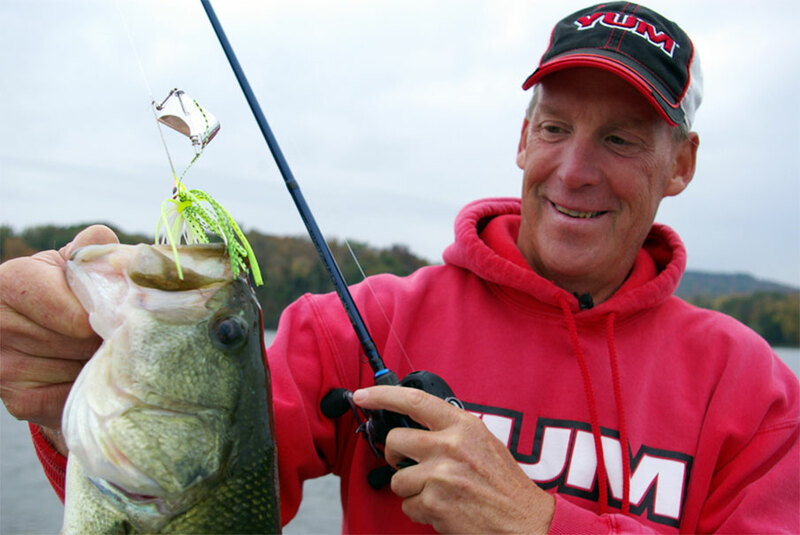 Buzzbaits appeal to the aggressive nature of bass and draw reflex-type strikes. They also have the uncanny ability to “call up” fish holding in deeper water. This means you don’t have to hit a bass on the head to elicit a strike. You can use the lure to eliminate dead water in a hurry by simply fan-casting across a chosen area. When bass are pinpointed, stop and cast away. For a buzzbait to work properly as a surface lure, it must be retrieved on a tight line. Anglers often remove slack by pointing the rod tip straight up during retrieve, but when this is done, there’s no leverage angle left for the upward sweep of the rod during hookset. To increase your hooking percentage, keep the rod pointed toward the lure at 9 or 10 o’clock, and use a high-speed reel (retrieve ratio of 6:1 or higher) to keep the buzzbait skittering over the water’s surface. During spring, check all cover objects in shallow water thoroughly with a buzzbait. Place each cast so the lure goes beyond the object. Then maneuver the lure so the blades scrape the log, stump, etc. on retrieve. A buzzbait can be very effective when retrieved at a slow, steady pace, but if bass ignore a dawdling lure, try racing the buzzbait, using an erratic retrieve that alternates between frantic and a crawl, or “porpoising” the bait with little jumps. Periodically slow the lure enough so it drops beneath the surface. These methods may produce when a steady retrieve won’t. Bass often will stalk beneath a buzzbait and suddenly explode in your face as you lift the lure from the water. When this happens, react quickly. Jab your rod tip in the water and weave the buzzbait in a figure-eight pattern. Frequently, a mean old largemouth will turn right around and smash the lure. When it happens, it’s like hooking a whale in the tail. If you aren’t using buzzbaits, you’re missing one of the most exciting experiences in bass fishing. Nothing is more exhilarating than seeing, hearing and feeling a lunker largemouth exploding beneath a sputtering, spitting buzzbait. If your buzzbaits have been relegated to the “don’t-fish” pile of lures, pull them out and put them back to work. The biggest mistake you’ll ever make with a buzzbait is to leave it in your tacklebox.